Meleagris satyra Linnaeus, 1829, Bengal = Sikkim, India. Monotopic. 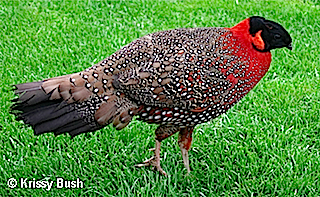 English: Crimson tragopan, Indian tragopan, crimson horned pheasant; French: Tragopan satyre; German: Satyrtragopan; Spanish: Tragopбn Sбtiro. Male 26–28 in (67–72 cm); female 22–23 in (57–59 cm); male 3.5–4.6 lb (1.6–2.1 kg); female 2.2–2.6 lb (1.0–1.2 kg). 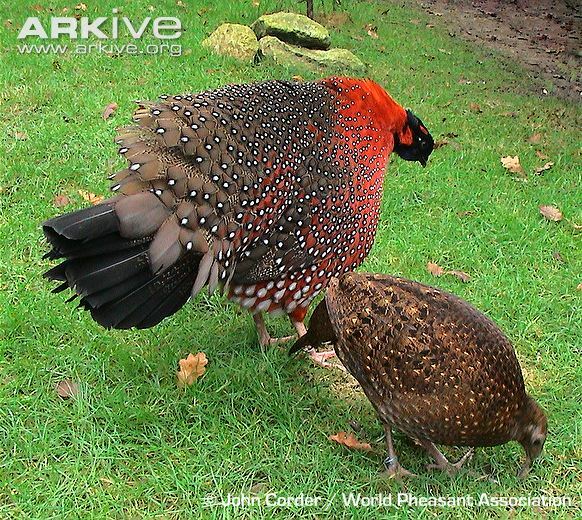 Males have deep red underparts, bare blue facial skin, and brown plumage on lower back and rump; upperwing-coverts also brown. Females are dull brown to rufous with bars and lanceshaped markings. Himalayas from northern India through Nepal, Sikkim, Bhutan to western Arunachal Pradesh, including southeastern Tibet. Temperate montane forest with dense understory at 5,900–14,100 ft (1,800–4,300 m). 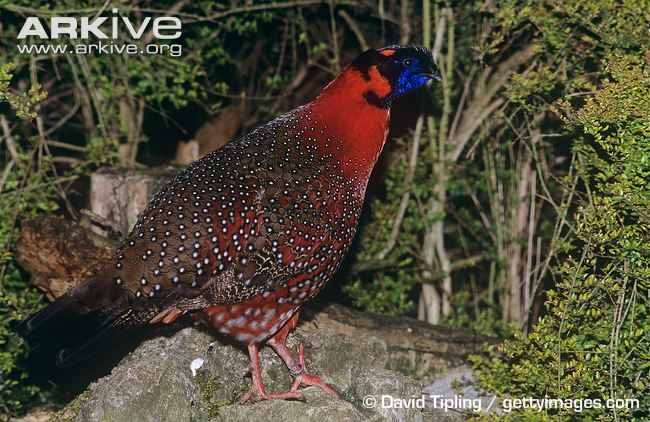 Usually in pairs or singles early in year, and family parties in July–September; male’s repeated wailing call at dawn from roost in April–June heralds breeding season. Roots, bulbs, and invertebrates, and plucking leaves from cover and trees. Monogamous in captivity; usually crude stick nests are constructed up to 20 ft (6 m) in trees; clutch size two to three; incubation 28 days. 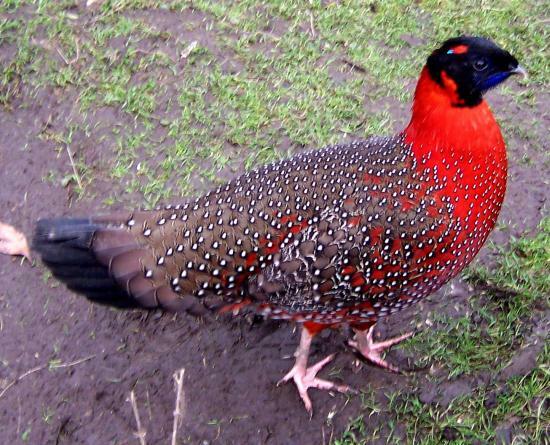 Not threatened and still widespread, but hunted (except in Bhutan). 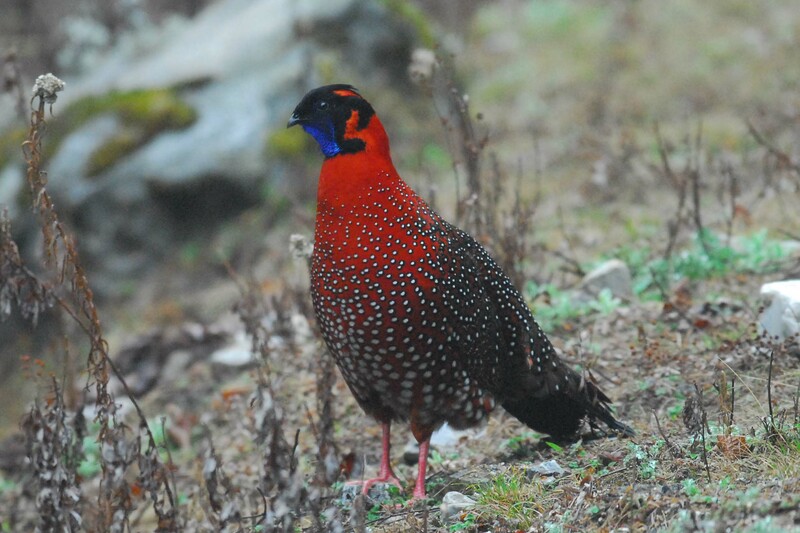 Used as a flagship for central Himalayan forest conservation campaigns.